Blog Reader Choices, Feedly, etc. It’s coming… July 1st, 2013. On that date, when you wake up, Google Reader will be gone. You may have noticed that on the right side of my blog there is a link you can click to follow my blog on bloglovin. That is one option. You could also choose to follow my blog (and others) on Feedly. That’s the green logo. Both work quite well to follow any blog you’d like. You can choose any other blog reader to follow any kind of blog you would like. Should you need the information, the rss feed for Michigan Quilts is: http://blog.caronmosey.com/?alt=rss . So, on to the world of quilting. What have I been doing lately? Taking a little break, actually. I’ve been tired lately, and have been enjoying catching up on some reading. My Kindle has had a good workout these last few weeks! I did manage to squeeze in some time to work on trapunto )photo at left) for a class sample for my hand quilting class. I really enjoyed the process, which was new to me. 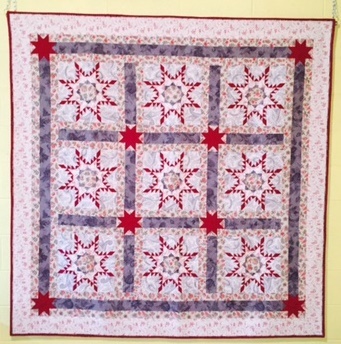 I also put in more time on hand quilting my feathered stars quilt (photo on right). This is a project in slow motion, as it is heavily quilted. We have had quite a bit of rain in Michigan lately, but it has helped the garden tremendously! The rhododendrons look beautiful close up, but I don’t like the yellow leaves that are taking over. I think the soil is lacking something, but I’m not sure what. If you are a fan of rhodies and have any ideas, I’d love to hear from you! I have gone with feedly as well basically for the same reasons. I put it on last week and haven't switched back to google reader once since. Seems to be very easy to use. I too have been putting the kindle to use and quilting/piceing. Maybe Tim will know what is going on with the plants with the yellow leaves? I sort of picked Bloglovin' for now–not really liking the format, like you said. My question is–how and WHERE do we write a post for our own blogs? Will Blogger still be there for that? Thanks for any help uou can send Caron. 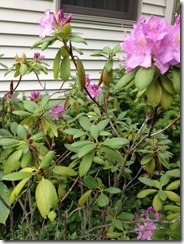 I think your Rhodies need an acidic fertilizer or a pine needle mulch…they are beautiful! I would be interested in knowing what your favorite hoop is when you hand quilt. I have used the plastic Q-snap and am thinking about a wooden hoop but as I can't find any locally will have to order on-line. A frame won't work for me as I have very little space in my living quarters. Rhododendrons prefer an acidic fertilize as MB said. I discovered that if you use a wood mulch, that can cause yellowing leaves as well. Use of mulches like fresh sawdust or wood chips can create a nitrogen deficiency caused by the decomposition of these materials. Unless nitrogen is added, the plants may show yellowish foliage and poor growth. I'm using Feedly as well … for the reasons you gave and because I had so many problems with Bloglovin (worst problem was that it wouldn't pull in new posts on some of the blogs I'm following … Bloglovin showed that I was following those blogs, but it wouldn't pull in the new posts … several emails to Bloglovin support didn't fix the problems).